The Full Range of Pies! At Eat Square we use the best local meats from rare breed and pedigree pigs and cattle. They are all free range and butchered at Church Farm in Broughton Gifford, just a couple of miles down the lane from our bakery. Our care and attention to ingredients go to the vegetables we use as well, which are again locally sourced. All our eggs are free range too! Once we have our fillings prepared they go inside our own rich and flaky short-crust pastry. This is made by us in small batches to achieve the best possible consistency and flake. For cooking / reheating instructions click here. Classic and simple fillings made of the best local ingredients wrapped in our own short crust pastry. We now have new production capacity and have started making a new range of pies. Larger in size and deeper filled we hope that you will like these even more then our previous award winning pies. Currently you can order Steak, Steak and Cheese and Chicken Balti. Soon to follow will be Lamb, Chicken and Mushroom, Roast Vegetable (vegan) and our classic Steak and Ale - only bigger and deeper. We slow cook this delicious meat in Wadworth 6X Ale and add some herbs and English mustard for several hours until tender. This gives a full deep flavour and rich gravy. Steak and Ale Pie Ingredients: Beef and Ale Filling (55%)(British Beef (28%), Wadworth 6X Ale (source of gluten), water, onions, plain flour, carrots, celery, tomato puree, English mustard, garlic granules, beef stock powder (contains celery), salt, black pepper, dried oregano) Pastry 45% (plain flour, water, unsalted butter (milk), lard, free range egg yolks, salt). Wiltshire free range chickens from Church Farm have a lovely full flavour. Free range is for the discerning customer and it's this that makes this chicken pie that much more special. We use only free range chicken breasts in our pies. We chop these up and cook them with bacon and mushrooms in a thick sauce. The sauce has a hint of French mustard and a little thyme to enhance the flavour. We a;so pre-roast the bacon for a more intense rich taste. Chicken, Bacon and Mushroom Pie Ingredients: Chicken and Mushroom Filling (55%) (British free range chicken 24%, water, bacon, mushrooms, onions, flour, dijon mustard, chicken stock powder (contains celery), garlic granules, salt, black pepper, dried thyme) Pastry 45% (plain flour, water, unsalted butter (milk), lard, free range egg yolks, salt). Church Farm's own beef ground and mixed with spices and stock to make a rich full flavour gravy. 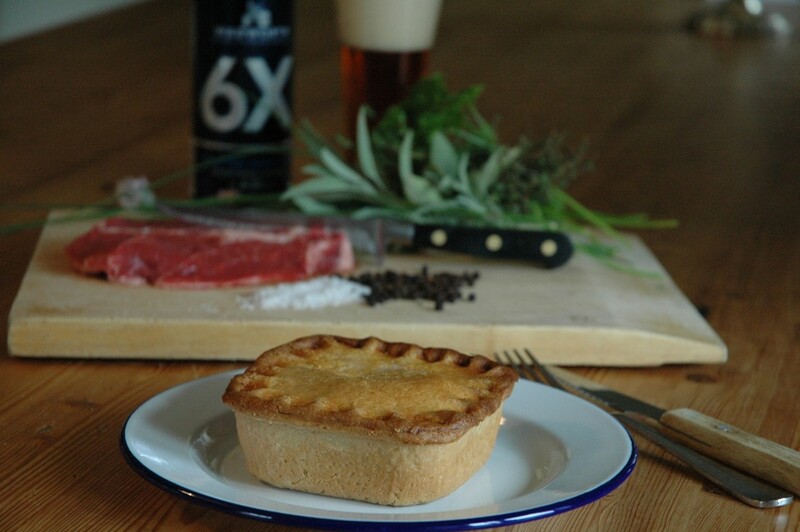 This is our version of a chip-shop pie, only with free range quality Wiltshire beef and our own shortcrust pastry. Fantastic hot with chips or potatoes and gravy or curry sauce for the more adventurous. 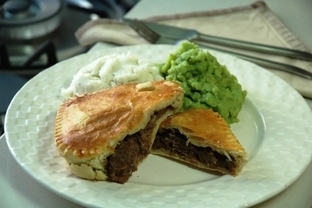 Wiltshire Beef Pie Ingredients: Beef Filling (55%) (Wiltshire Minced Beef 27%, water, onions, gluten free flour, celery, carrots, Worcestershire sauce (contains mustard), beef stock powder (contains celery), garlic granules, salt, black pepper, paprika, ginger, ground coriander. Pastry 45% (plain flour, water, unsalted butter (milk), lard, free range egg yolks, salt). We add a few pieces of tender apple, a little sage and not much else to this so as to keep the flavour of the meat. This gives a rich and slightly sweet gravy and makes a fantastic pie filling. 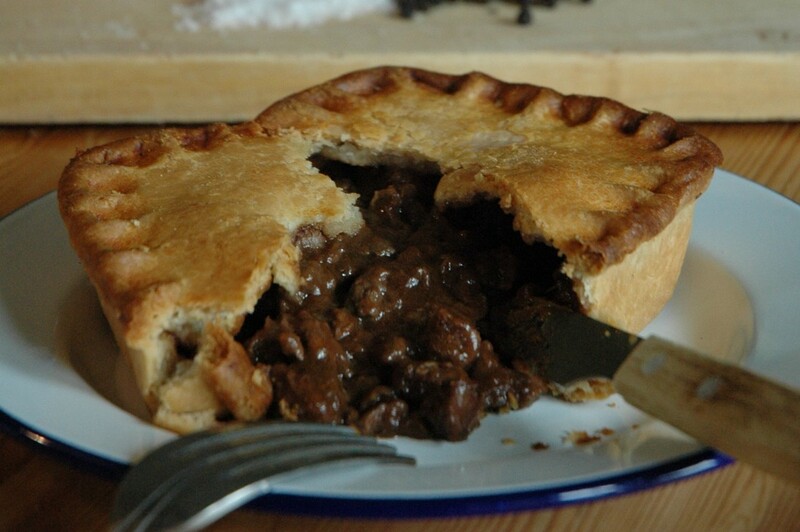 This is a very popular pie especially in cider loving Wiltshire and Somerset! Pork and Cider Pie Ingredients: Pork and Cider Filling 55% (Pork 28%, Moles Black Rat Cider, water, onions, diced apple, plain flour, carrot, celery, chicken stock powder (contains celery), salt, pepper, sage) Pastry 45% (plain flour, water, unsalted butter (milk), lard, free range egg yolks, salt). Allergens: Wheat, Gluten, Milk, Eggs, Mustard, Celery. New in 2017 and already one of our most popular items at events and markets. 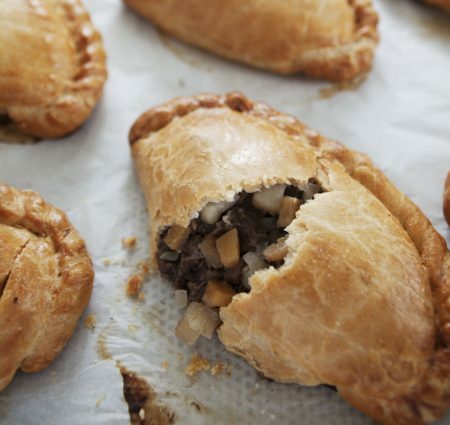 Free Range Pasties are the Eat Square version of a traditional pasty. Made with free range grass fed local beef or our own curry vegetable mix. Free range eggs go in to the pastry which is our own recipe short crust mix. Traditional steak is just that, beef steak, potato, swede and a little onion; seasoned with salt and pepper. Simple and just as a pasty should be. Also available are Chicken and Chorizo, Cheese and Onion and Roast Vegetable (vegan). 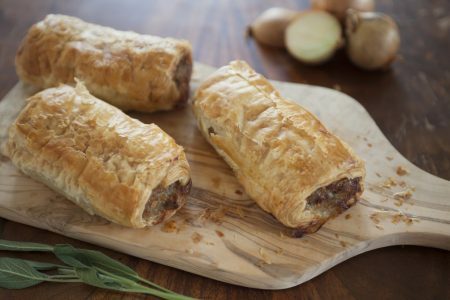 Packed full of local free range pork these sausage rolls are rich and filling. Church farm rear the free range pigs just down the road and then make the sausage meat for us. Wrapped in classic flaky pastry with a meat to pastry ratio of about 1:1 these are rich, tasty and filling. 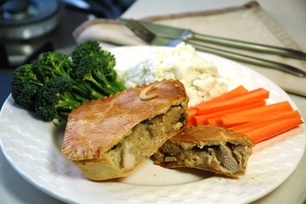 You can get Gluten Free, Dairy Free, Vegetarian and Vegan Pies from Eat Square. Nut Free - we operate a nut free kitchen. We don't use any artificial preservatives in our pies. We have them tested professionally for shelf life and recommend that they are consumed within about a week from manufacture. Full allergy advice is available in the detailed information in the pie shop as seen here.